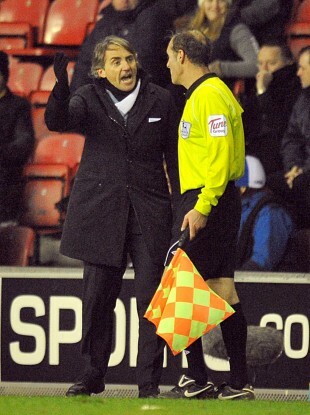 Mancini appealing to the assistant referee last night. MANCHESTER CITY MANAGER Roberto Mancini has attempted to justify gesturing for Maynor Figueroa to be sent off – a week after criticising Wayne Rooney for doing the same thing. The Wigan defender committed a cynical handball in the 89th-minute of last night’s Premier League game, which City won 1-0, and received a yellow card from referee Martin Atkinson when it could easily have been a red. Replays showed that, had the Honduran international not made the illegal interception, Sergio Aguero would’ve received the ball at the halfway line where only keeper Ali Al-Habsi stood between him and the goal. Mancini was incensed when Rooney signalled that Vincent Kompany’s challenge on Nani was two-footed during United’s FA Cup win last weekend after it led to a sending off for the City captain and a four-game ban. However, he immediately brandished an imaginary card after the Figueroa incident and when asked about it post-match suggested that it was acceptable for managers but not for players. I used to do this but I don’t want to say anything,” he said in The Daily Mail. ”Wayne Rooney did this. It is normal with a chance like that to do it. Email “Figueroa handball leads Mancini to wave his imaginary card”. Feedback on “Figueroa handball leads Mancini to wave his imaginary card”.